[Contains explicit content] Welcome to San Francisco Sketchfest 2018! Here's your front row seat, your backstage pass, and your all-access badge to one of the biggest comedy festivals in the country! It's a three-week celebration of live comedy featuring: stand-up, improv and sketch, podcasts, game shows, tribute shows, musical comedy and much more. With hundreds of live shows and over one thousand performers, it's impossible to catch everything at the festival -- even for a diehard comedy fan or an adventurous San Francisco resident. Fear not! We've selected some of the funniest moments for you. In this live event special, we're taking you up on stage, behind the scenes, and to the after-party. You'll hear live performances and backstage interviews with Ricky Gervais, Maria Bamford, Jon Hamm, Dan Savage, Janeane Garofalo, Christopher Guest, Baron Vaughn, Lewis Black, Eugene Mirman, Maeve Higgins, Jonathan Katz, Kevin Pollak, and many more. With your VIP Pass courtesy of Audible, relive some of the top festival highlights and discover new comedians. Then, we hope to see you at SF Sketchfest in 2019! Featuring (in order): J.B. Ball, Cole Stratton, David Owen, Janet Varney, Ricky Gervais , Christopher Guest, Lewis Black, Janeane Garofalo, Bret Raybould, Dan Savage, Esther Povitsky, Rachel Lark, Maria Bamford, Dana Gould, Randy Sklar, Jason Sklar, Alexandria Love, Kenice Mobley, Sean McKenzie, JoAnn Schinderle, Jesse Hett, Jim Short, Maeve Higgins, Aisling Bea, Eugene Mirman, Thomas Lennon, Paula Pell, Paget Brewster, Jonathan Katz, Baron Vaughn, Becky Braunstein, Steph Tolev, Chad Opitz, Eric Martin, Kevin Pollak, Jon Hamm, Epic Rap Battles of History (Peter Shukoff & Lloyd Ahlquist). This is NOT an audiobook -- it's a fairly brief, behind-the-scenes / on-the-ground listening experience that gives you a feeling of being at a comedy festival. It's fun and enjoyable and a nice extra for being an Audible customer. If you're expecting an audiobook with a strong narrative, you will be sorely disappointed. If you'd like to just be entertained for a bit, and you like comedy, this could be for you. A really fun slice of a Fest and interviews! Would you listen to VIP Pass: SF Sketchfest again? Why? Yeah, there are some great jokes peppered through and I think will definitely be fun repeated listening or background content while I'm doing chores, etc. MARIA BAMFORD and JANEANE GAROFALO! I'm very happy they got those two on there, they're comedians I really love listening to on and off stage for their unique perspectives and you don't get to hear them talk off stage all that often. Also, the SKLAR BROTHERS! What a tour de force of comedy and they had a great scene. There's so many different narrators I don't think you can really comment on this too much. Yeah, an hour piece is such a great consumable thing. Please make more! I'd love one from Just For Laughs, Moontower, Limestone, etc. Maybe also different types of festivals as well! I've never been to sketch fest, but after listening to this I plan to attend next year. What fun! 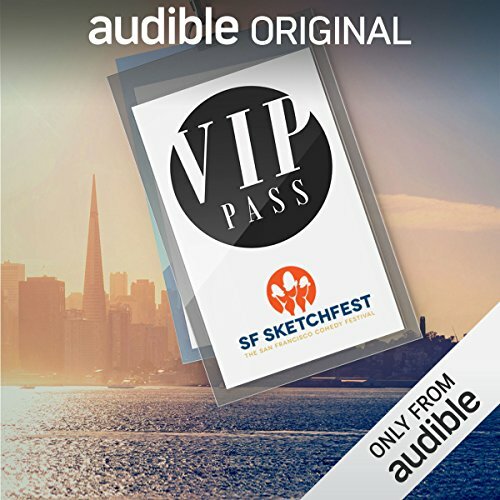 Would you consider the audio edition of VIP Pass: SF Sketchfest to be better than the print version? Yes, comedy is best spoken out loud. No, but I will now. loved Dan Savage, Ricky Gervais. Happy to now know about Sketchfest..
We plan on attending live next year, based on this. Enjoyed this sampling - got enough from each artist...Well done!! My husband and I listened to this tonight and loved it. Great interviews and outtakes. Felt like we were behind the scenes at Stitchfest. And laugh we did! It’s also a love fest for Dan Francisco and the community of comedians. We want more!! This was an audio documentary and didn't have a narrator -- which was fine! Sketch is a really awesome thing that's happening and I enjoyed listening to the story! Absolutely. This was a fun and breezy listen, perfect for the commute that gave me the sense of a comedy festival. I attended the festival, but it's impossible to catch everything so I got to hear highlights from the shows I missed. What was one of the most memorable moments of VIP Pass: SF Sketchfest? I loved hearing Ricky Gervais in conversation with Christopher Guest. Those are two of my comedy heroes so was awesome to hear them going back and forth! VIP Pass doesn't really have a narrator, it's more like a documentary which was cool. I cracked up on the bus during some of the stand up jokes!